JOHN CUMMINGS (c. 1565 – 1633/4) of Easthorpe and Copford m.
John was born about 1565. [Ref] He could have been the John Cowman, baptized 23 Jul 1561 in Bocking, county Essex. Bocking is about eleven miles from Copford. [Ref] John Cummings died between 8 Nov 1633 and 24 Apr 1634. He is believed to have married Amy Green. The Copford, co. Essex parish register says, "Matrimony was solemnised the [Blank] Daie of [Blank] Between [Blank] Commins and Amy Greene Daughter of John Grene of much-birch." The entry is undated but appears between 1 Sep 1590 and 26 Feb 1593/1594. [Ref] Amy may be the wife of John Cummings who died in Copford, co. Essex on 3 Nov 1612. John may have married a second time. A second wife would have died before 8 Nov 1633, when John signed his will. Much Birch [Great Birch] is part of Birch, a parish near Colchester in county Essex. Little Tey, Marks Tey and Much Tey [Great Tey] are villages near the town of Colchester in county Essex. Lexden is a former village and now a suburb of Colchester. Brickellsie may be Brightlingsea, a town in county Essex near Colchester. Ipswich is 18 miles from Colchester. Ursula Cummings was baptised on 8 May 1597 in Easthorpe. [Ref] She was probably unmarried on 8 Nov 1633. Isaac Cummings was born about 1601 in Easthorpe. He was baptised on 5 Apr 1601. He died between 8 and 22 May 1677 in Topsfield. He married Anne Unknown. It was not unusual in this period in England to use the same name for two different children. Daughter Cummings (possible daughter) was baptised on 28 Feb 1619/20 in Copford. [Ref] If Amy died in 1612, then she is likely the daughter of a second wife. The Copford parish register says that on 1 Nov 1610, John Cummings buried three children. These could include Mary and the second John, who were not mentioned in John's will, and a third child whose baptism was not recorded. 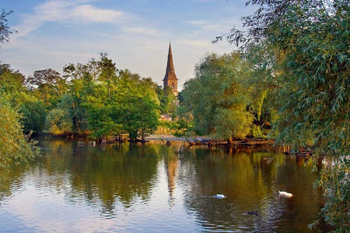 It is possible that the children baptised in Copford belong to a different family. This photo is of the pond where Witch finder General Matthew Hopkins used to dunk witches. The 19th century Mistley church is in the background. Corp. John Cummings was born about 1629/1630. He was baptised on 9 May 1630 in Mistley. He died on 1 Dec 1700 in Dunstable. He married Sarah Howlett. Dea. Isaac Cummings was born about 1633. He was baptised on 17 Mar 1632/3 in Mistley. He died in Jun 1721 in Topsfield. He married Mary Andrews. There was another John Cummings alive at the same as this John: John Cummings of Salem, a mariner. John Cummings was born about 1657. He died after 3 Jul 1706. He married Elizabeth Kinsley. There was Likewise a cluster of Depositions, that one Isaac Cummings refusing to lend his Mare unto the Husband of this How, the mare was within a Day or two taken in a strange condition. The Beast seemed much Abused; being Bruised, as if she had been Running over the Rocks, and marked where the Bridle went, as if burnt with a Red hot Bridle. Moreover, one using a Pipe of Tobacco for the Cure of the Beast, a blew Flame issued out of her, took hold of her Hair, and not only Spread and Burnt on her, but it also flew upwards toward the Roof of the Barn, and had like to have set the Barn on Fire. And the Mare dy'd very suddenly. Isaac Cummings was born on 15 Sep 1664 in Topsfield. He died on 7 Aug 1746. He married first Alice Howlett. He married second Frances Sherwin. Thomas moved to Boxford before his marriage. [Ref, p. 401] Perley [Ref, p. 401] says that Thomas and Mary had four children, "one of whom, Jacob, lived here, and had seven children, two of whom were Dudley and Thomas,  two queer characters, whose non compos mentis state is well known to our older inhabitants." Dea. John Cummings was born on 7 Jul 1682 in Dunstable. He died on 27 Apr 1759 in Westford. He married Elizabeth Adams. Isaac Cummings was baptised on 24 Apr 1692 in Topsfield. He died on 12 Oct 1761. He married Abigail Boardman. Mary Cummings was born on 5 Jul 1708 in Chelmsford. [RefRef][Ref] She died on 3 Nov 1778 in Dunstable. [Ref] She married Timothy, the son of Thomas and Sarah (Fletcher) Read, on 10 Nov 1732. [Ref] He was born on 21 Mar 1714 in Westford. [Ref] Mary and Timothy had five children. Lieut. John Cummings was born on 1 Jun 1710. [Ref] He died on 20 Sep 1789. [Ref] He is buried in the Pine Ridge Cemetery in Hancock, New Hampshire. [Ref] He married Sarah Lawrence on 28 Jan 1735/6. [Ref, d. Eleazer and Mary (Scripture) of Littleton] She died on 3 Oct 1799. [Ref] In 1729, John was admitted to the church at Westford. [Ref] He was dismissed to the church at Groton. [Ref] He moved to Hancock, NH and was one of the 17 people who formed the Congregational church their in 1788. Abigail Cummings was born in Nov 1716 in Chelmsford. [RefRef][Ref gives only the year] She died on 23 Mar 1743. [Ref] She married Samuel, son of John and Jane (Chamberlain) Read, on 23 Nov 1732. [Ref] Samuel was born on 11 Aug 1711. [Ref] He married second the widow Hannah (Wright) Underwood on 22 Jun 1757. 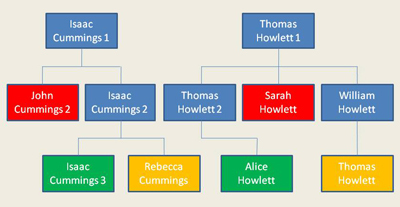 [Ref] Abigail and Samuel had four children. Bridget Cummings was born on 15 Nov 1722. She died on 19 Oct 1778 in Westford. She married Lieut. Moses Parker. Elisha Cummings was baptised on 2 Aug 1719 in Topsfield. He died in 1790. He married first Mary Andrews. He married second the widow Jemima Marston. Elisha Cummings was born on 20 Sep 1754 [Ref, p. 77][Ref, p. 82] in Topsfield. [Ref] He married Elizabeth Marston. [Ref, p. 77] Mooar [Ref] and Cummins [Ref, p. 188] suggest that Elizabeth might be Jemima's daughter. Nathaniel Cummings was born on 16 Jan 1761 in Topsfield. He died about 1818. He married Mary Crawford. In New Hampton on Friday the 30th October Mr. Nathaniel Cummings, aged 59, by a wound he received from his own Bull, which tore him in such a shocking manner that he survived about twenty-five hours and expired: he has left a disconsolate widow and ten children to mourn the loss of a kind husband and one of the best parents, a good neighbor, a good citizen, and a good christian. Rev. Cyrus Cummings was born on 23 Apr 1791 in Bridgewater. He died on 9 Sep 1859 in Portland. He married Elizabeth Curtis. 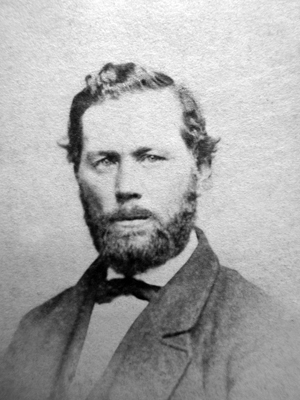 Franklin Cummings was born on 18 Sep 1823 in West Cumberland. He died on 12 Aug 1874 in Brownsville. He married Ann Mildred Jones. Andrew Jackson Cummings was born on 10 Mar 1836 [Ref, p. 321][, in Portland] in Allen's Corner, now within Portland. [Ref, p. 406][Ref, does not give the day or town] Andrew, a retired widower and life-long resident of Portland, died of a cerebral hemorrhage on 6 Sep 1918, age 82, in Portland. [Ref, death certificate gives both parents names and places of birth] He was buried in the Evergreen Cemetery in Portland on 8 Sep 1918. [Ref] He married Elizabeth Ellen Jones on 1 Jul 1858. [Ref, p. 321][Ref, p. 406] She was born in Jul 1838 [Ref, p. 406, says 4 Jul 1840] in Maine. [Ref] She died after 1900, when she appeared in the census, and probably before 1910, when she does not. The three children who died within days of each other in the summer of 1832 must have been victims of the 1832 cholera epidemic. 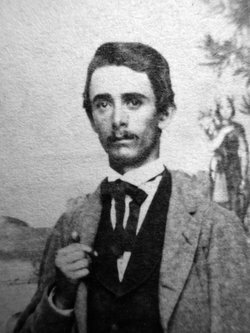 Joseph was in Mexico from 1884 to 1886. [Ref, p. 38] He was superintendant of the public schools in Brownsville 1888 to 1889. [Ref, no dates][Ref, p. 38] He was the captain of Company A, 1st Regiment of the Texas Volunteer Guards in 1888 and resigned July of that year. 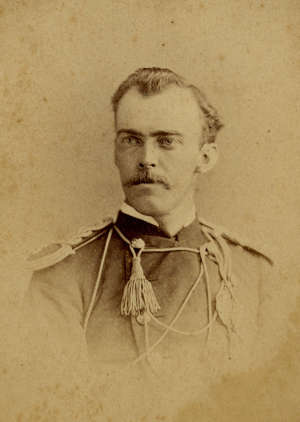 [Ref, p. 38] He was captain of company C, 1st Regiment of the Brownsville Rifles, Texas Volunteer Guards until the company was disbanded in 1890. [Ref, p. 38] In 1900 he was a customs inspector in Brownsville. [Ref] He resigned in Aug 1900. [Ref, p. 250] He was proprietor and editor of The Border News in Brownsville until 1902. [Ref, p. 250] He was the purser of the steamship Manteo, employed in the gulf trade until Nov 1902. [Ref, p. 250] He was a civil engineer assisting in the building of the Galveston seawall from Nov 1902 to Nov 1903. [Ref, p. 250] He was principal of a school in Galveston from Nov 1903 to Jun 1904. [Ref, p. 250] He was employed by the U.S. Engineer Department in Pittsburgh until 1906. [Ref, p. 250] He was later principal of public schools in Greenbackville, Virgina [Ref, p. 250] and taught school in Tappahannock, Virginia [Ref, p. 38]. He bought the Plaza Hotel in Washington, DC and managed it until his death, which occurred as a result of an operation for stomach cancer. 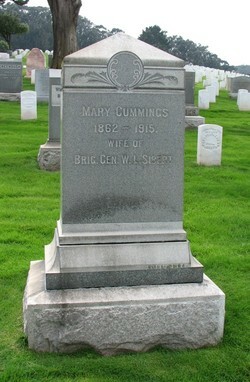 [Ref, p.
Elizabeth Ann Cummings was born on 24 Sep 1854 [Ref, p. 440][Ref] in Brownsville. [Ref] She died on 13 Nov 1890 [Ref] in Brownsville. [Ref] She married Thomas Benjamin Russell of Brownsville on 22 May 1876. [Ref, p. 440][Ref] Thomas was the son of William J. and Eleanor H. Russell. [Ref] He was born on 31 Jan 1850 in Texas. [Ref, no day][Ref] He died on 26 Sep 1929. [Ref] Elizabeth and Thomas are buried in the Old City Cemetery in Brownsville. Click here to see a photo of their grave. 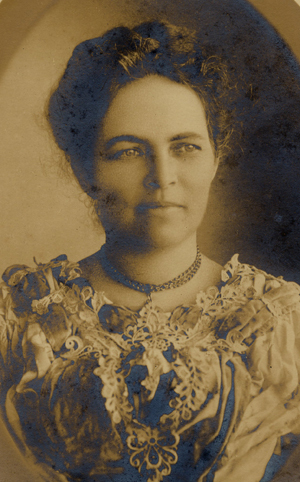 Mary Margaret Cummings was born on 16 Aug 1862 in Matamoros, Taulipas, Mexico. 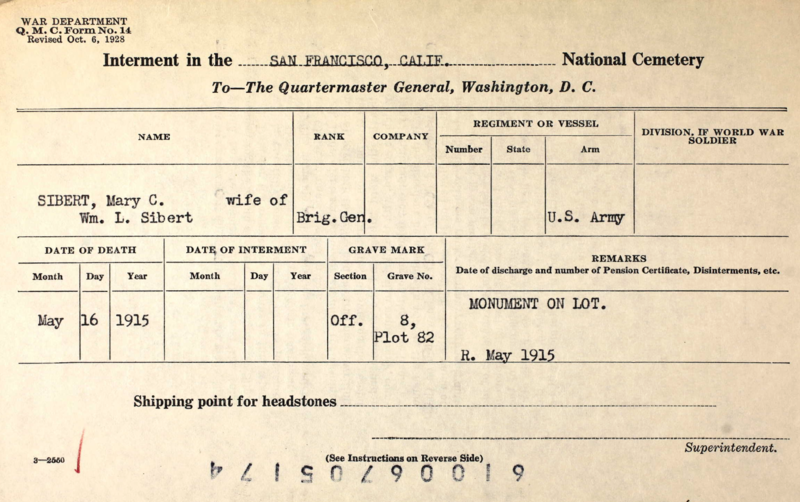 She died on 16 May 1915 in San Francisco She married Maj. Gen. William Luther Sibert. 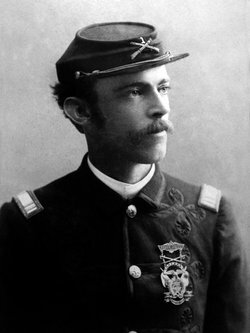 John Augustus Cummings was born on 15 Aug 1865 [Ref, p. 440][F] in his mother's old home in Maryland. [Ref says Montgomery co.] He died on 9 Jan 1890 [Ref] in Galveston. [Ref] He is buried in the Old City Cemetery in Brownsville. [Ref] He never married. [Ref] Click here for a photo of his grave. Mary's baptism record lists her birth as Matamoros, Mexico. "That was pretty common then as there were more and better doctors across the river." 1. Click here to see the image.